persevere, to face challenges and to overcome failure. non-academic skills that are necessary for success. deficit practices in the education of young people. are being used as a way of predicting a student’s ability to persevere. – on a test, a challenge, a class – may be more important. not frame things in a manner that is relevant to educational practices. conceptually shown to be valid. school effectiveness are rarely considered. You either have grit or you don’t. And what is a school to do with that idea? conclusive evidence of being malleable. lack the traits found in high achieving cadets from West Point. approaches to strengthen non-cognitive skills. Duckworth, A.L., & P.D. Quinn. “Development and Validation of the Short Grit Scale (grit-s),” Journal of Personality Assessment (2009) 91, 166-174. Shaping School Performance: A Critical Literature Review (Chicago: University of Chicago Consortium on Chicago School Research, 2012). information request and feedback form. I write to share this policy memorandum titled, “High-Stakes Accountability in Texas Reconsidered [pdf],” co-authored by Dr. Angela Valenzuela, Wei-Ling Sun, Michael Barnes, and Emily Germain. It is a version of a memorandum presented at the Texas State Capitol on Nov. 18, 2014 in the context of the University of Texas at Austin Texas Center for Education Policy (TCEP) Graduate Seminar. The TCEP Graduate Seminar was instituted in the 2014-2015 academic year, to allow professors and graduate students to collaborate on policy briefs and memos related to critical issues facing Texas that get debated and considered in the Texas State Legislature. I am pleased to say that our brief was in fact taken into consideration months ago as the bill proposal leading to what is now SB 149 was getting developed. As my earlier post to the blog this evening on Senate Bill 149 suggests, high-stakes testing and accountability are very much under consideration this legislative session in Texas. There ARE ways out of this terrible testing conundrum that we have sewn ourselves into. This memorandum lends some clarity to the policy options before us as a state. Additionally, we are working with Education Austin (i.e., the teacher’s union that is AFT and NEA combined) and State Rep. Mary González (D-El Paso), who was recently appointed to the Texas House Public Education Committee. This involves the development of legislation that calls for a study which could effect a significant shift in assessment in Texas—that is, from a high-stakes to an informational framework in a consortium of schools within select school districts statewide. As a statewide initiative, this legislation would create a "consortia of consortium high schools," if you will, that collectively reflect Texas' demographics statewide. More specific details shall be forthcoming. This initiative would first lay the groundwork for a new system of authentic assessments in "study schools" and thereafter lead to the development and implementation of a research-based framework of authentic—including project-based assessment—systems, modeled after the New York Performance Standards Consortium schools. In a similar vein, we also draw inspiration from a similar effort in certain districts in Kentucky (http://wutc.org/post/kentucky-students-succeed-without-tests). Once it comes out of the Texas Legislative Council (they're a bunch of attorneys that draft bill proposals into bill language) and we have a bill number, we plan to have a press conference at the Texas State Capitol and will post an announcement of that event to this blog. Fingers crossed that this happens soon. Principal Association. I am very proud of all of the hard work that we have done on this bill proposal. On the subject of accountability, our whole system needs re-vamping. Check out this policy brief authored by our Education Policy and Planning doctoral students and me as part of the Texas Center for Education Policy (TCEP) Graduate Seminar that specifies alternatives available to our state here. My next post elaborates on this further. Amid an ongoing backlash against high-stakes testing, Texas high school seniors facing new graduation requirements might get the chance to walk the stage this spring despite failing one or more required state exams. State Sen. Kel Seliger’s Senate Bill 149 would allow thousands of high school seniors who have failed one or more of five end-of-course tests more than once to receive their diplomas anyway as long as a special panel — made up of their parents, principals, counselors and teachers — unanimously determines they should be able to. The students still would have to pass all their classes and maintain a 2.0 grade point average. Legislation by state Sen. Kel Seliger, R-Amarillo, would ease high school graduation testing requirements. The Amarillo Republican said Thursday the legislation is urgently needed given the sheer number of high school seniors who are at risk of not graduating this May because they have failed one of the State of Texas Assessments of Academic Readiness, or STAAR, exams that now are required for graduation, warning that if they do not get their diplomas they’ll likely drop out. “Without a high school diploma, these students cannot attend college, join the military or qualify for many jobs,” Seliger said at the beginning of the Senate Education Committee’s first meeting of the legislative session as the panel heard public testimony on his bill. With the onset last year of the more difficult end-of-course exams, more than 28,100 current high school seniors — about 10 percent — have failed at least one test, according to the Texas Education Agency. That compares with about 9,000 seniors who didn’t receive diplomas last year because they failed the easier Texas Assessment of Knowledge and Skills test. The class of 2015 has one final chance to pass exams in May — the same month graduates will walk the stage. Emphasizing the urgency, Seliger informed the committee Thursday he intends to try to circumvent a ban on considering legislation within the first 60 days of a legislative session so his bill could take effect as soon as possible. That would require a four-fifths majority vote in both chambers of the Legislature. After the hearing, Seliger expressed strong confidence that his bill would clear that rarely attempted high bar. And the committee seemed mostly to support the measure Thursday, while educators gave it a ringing endorsement. However, Seliger also faced tough questions from some Republican committee members, while receiving praise from nearly every Democrat. Republican Sens. Donna Campbell and Lois Kolkhorst both cast doubt on the measure with Campbell of New Braunfels asking whether the legislation would create a “disincentive” for students to not perform well on the exams and Kolkhorst of Brenham questioning the need for the tests at all if students can simply bypass them. Seliger’s effort comes two years after state lawmakers unanimously voted to reduce the number of required state tests from 15 to five, responding to similar fears about the impact on graduation rates. By law, students now must pass five end-of-course exams to graduate: English I, English II, Biology, U.S. History and Algebra I. The tests are administered three times a year. Those who testified in favor of Seliger’s bill Thursday expressed a lack of confidence in the ability of the new STAAR exams — or exams in general — to adequately determine whether a student should be able to graduate. Elgin school district Superintendent Jodi Duron, who thanked Seliger for his bill, said the new testing system “was poorly executed from its inception.” Most of the 40 seniors at Elgin High School who are at risk of not graduating likely would receive diplomas if the legislation passes, Duran said. Officials from other Austin-area school districts, including Pflugerville and Hays, told the American-Statesman they also support the legislation. Wanda Bamberg, superintendent of the Houston-area Aldine school district, estimated that at least 300 of the 390 seniors in her district who still need to pass an exam would graduate if the measure becomes law, although she suggested it should be a temporary program — applicable only to current seniors for whom graduation requirements have changed “mid-stream” to provide an adjustment period. She also gave several examples of students, including one who had been accepted to Prairie View A&M University, who won’t graduate if they don’t pass the May exam. The influential Austin-based group Texans Advocating for Meaningful Student Assessment — often credited for single-handedly getting the 2013 legislation passed that reduced the number of state exams — also testified in favor of the legislation, with President Dineen Majcher saying “the issues encompassed by SB 149 are critical priority issues to” the group. Business groups, however, including the Greater Austin Chamber of Commerce and the powerful Texas Association of Business, told the committee the bill’s mechanism isn’t the best way to accomplish its intended goal. Drew Scheberle, the Austin chamber’s senior vice president for education, suggested that the so-called “graduation committees” the bill would create would inevitably end up approving students for graduation even when they haven’t earned it. Asked about that criticism, Seliger told the Statesman that “if there’s a bias, there’s a bias toward educators,” emphasizing that the panels would have to reach unanimous consensus for the student to graduate. The bill was left pending at the end of the hearing rather than being put to a vote, but committee Chairman Larry Taylor said he intends to fast-track it to the Senate floor. “It’s heart-wrenching, and it’s also insanity when you see the level of achievement these kids are already doing, and yet they can’t even pass this test,” the Friendswood Republican said during the hearing. Additional material from staff writer Melissa Taboada. We here in Austin need to re-double our efforts in our struggle for economic justice. Not that this isn't already a major issue, but rather that elitist agendas and politics, by inference, are further unmasked, making it harder for the 1% to rationalize these savage inequalities. All of our institutions need to exercise a stronger role in addressing them. This is such an inspiring story. It is about an important policy intervention in Illinois called "Grow Your Own Illinois." Hats off to Dean Maureen Gillette for her leadership and also to NEIU trustee Marvin Garcia who leads his fellow trustees in supporting this. This effort involves resources from the Illinois State Legislature that have been cut over time, unfortunately. I am very moved by not only the passion and determination of this one student, but also the characterization of other students like her that similarly struggle but are determined. The Latino community is indeed very undereducated. An unfortunate stereotype exists out there that this community does not value education. This story offers a different perspective that is linked not to dysfunctional values, but rather to systemic, structural, and policy-relevant issues that fail to prioritize students' access to both financial aid and guidance and counseling that also cost money. None of us are automatically born knowing how to decode are complex system. Most of us do not have these "navigational tools" by fate of birth. This so-called "know-how" is an artifact of one's income, class position, relative racial/ethnic isolation in schools and neighborhoods, school funding equity (or lack there of)—and in the best of worlds, also related to legislative and policy priorities like Grow Your Own Illinois that make a difference in so many young people's lives with multiplicative impacts on the economy and thusly, the future of our nation. What is wonderful about GYO teachers is that not only are they very well prepared in places like NEIU and other universities—like Cal State University Sacramento, for example, that has been doing this for decades and very successfully—they also get prepared to offer instruction with the skills, knowledge, and dispositions that prepare them well to offer instruction to an increasingly diverse student body and world. Such programs have very strong connections and attachments to their communities and local environments that allow them to pretty much guarantee a teaching position to every person that graduates from the program. Their quality is undisputed, and neither is there "value added" given that these teachers have a different kind of investment from regular teachers that do not come from these communities from which GYO teachers emanate, and toward which they are prepared. Additionally, the investment pays off with respect to the proverbial "retention issue" that all but disappears with GYO teachers. Research shows that teachers like Idalia Vazquez featured in the story below last longer in the teaching profession than their counterparts that view teaching more as a pass-through then as a destination. The "pass-through teachers" (my term) are actually doing enormous harm to education because teaching is not quite their calling. Or if it seemed to be their "calling" for awhile, they get overwhelmed with the demands of the profession toward which so many are inadequately prepared (thinking here especially of TFA teachers). GYO is the way to go and I have only begun to articulate the reasons why. This story offers additional insight. 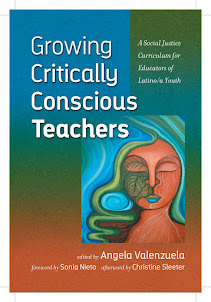 Grow Your Own Teachers helps low-income people of color who have the desire to become teachers earn a bachelor’s degree in education—a goal that would otherwise be almost impossible for them to achieve. Yet a recent news report fell short by viewing the program as a conveyor belt, and failing to capture what I and many other graduates felt by becoming the first person in our family to graduate from a university and get a job as a CPS teacher. 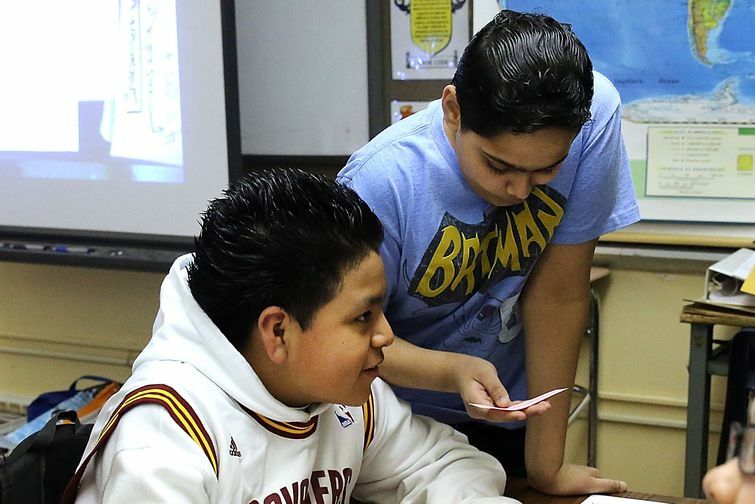 Grandkids of Latino immigrants are less educated than their parents. Blame assimilation. Important read on the problems that many of us scholars know to exist with respect to this grand ol' experiment of assimilation. As a family settles in the United States over a generation or two, it gets more assimilated. That's just as true for immigrants today as it was for immigrants a century ago (if not more so). After progress from first to second generation, there are retreats in outcomes, such as voter participation, school attendance, educational attainment, trust in institutions, trust and interchanges with neighbors, and disconnectedness from work and school.[...] Most third-generation youth who identify as Latino are doing poorly in many indicators of well-being compared with nonimmigrants and second-generation Latinos. Other research shows that the dark side of assimilation persists across ethnicities. According to a 2013 study in the journal Crime and Delinquency as explained on the Pew Research Center's blog, second-generation immigrants (the best-educated generation of Latinos in the Urban study) are much more likely to commit crimes than their parents. While foreign-born Americans have a strikingly low crime rate, their children — second-generation immigrants — just regress toward the mean. That chart makes it clear that becoming more "American" isn't always a good thing. It's important to think about the society that immigrants are being assimilated into. As the Urban report notes, in an unequal America, lower-income immigrants (especially lower-income Latino immigrants) are being assimilated into what researchers have called the "urban underclass" — where their children are at a disadvantage. But there's an interesting possibility which might explain some of the "U-turn" in the Urban report: not all third-generation immigrants still identify as Latino at all. It's possible that more-successful third-generation children are more likely to identify as white, while less-successful ones are more likely to consider themselves Latino. The question of how or whether Latinos will fully assimilate is key as the community continues to grow and establish itself as a force in American politics and society — and if Latino identity becomes something that only the least successful Latinos hold on to, that could pose a real threat to the group's growing electoral and social power. 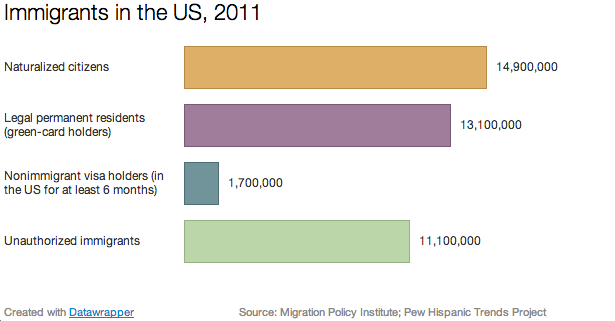 Who are the immigrants currently in the United States? As of 2011, roughly 40 million immigrants lived in the United States, according to the American Community Survey. The survey defines immigrant as any US resident who was born in another country. Of that group, 36 percent were naturalized citizens, 32 percent were legal permanent residents, 4.2 percent were on nonimmigrant visas (including work and student visas), and 27 percent were unauthorized immigrants. That's according to research from the Migration Policy Institute and the Pew Hispanic Trends Project. A little more than one-quarter of all current US immigrants come from Mexico. Another one-quarter come from South and East Asia. The Caribbean, Central America, and South America each contribute between 5 to 10 percent of the US immigrant population.